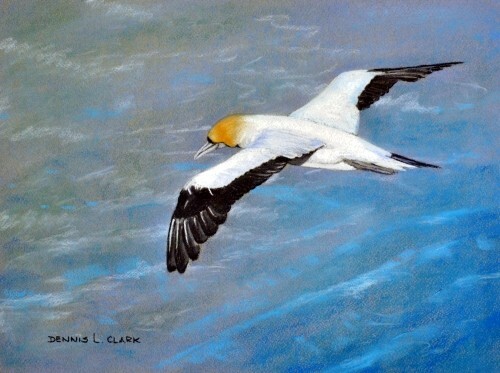 This Gannet is a resident of the Muriwai Gannet colony on the coast west of Auckland. This colony has approx 1200 breeding pairs. 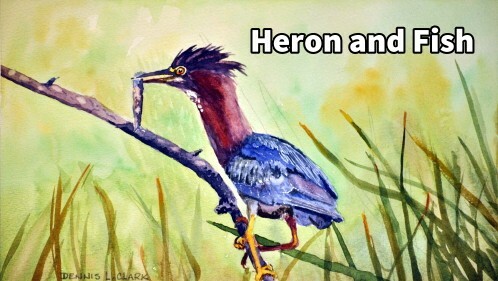 They are fairly large birds with a two meter (6 ft) wingspan. 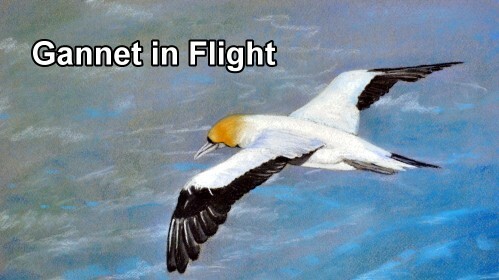 I believe the young Gannets fly to Australia once they leave the nest and then return a few years later to secure a nestting site. They are extremely swift in flight. 1. How to paint the out of focus sea surface. 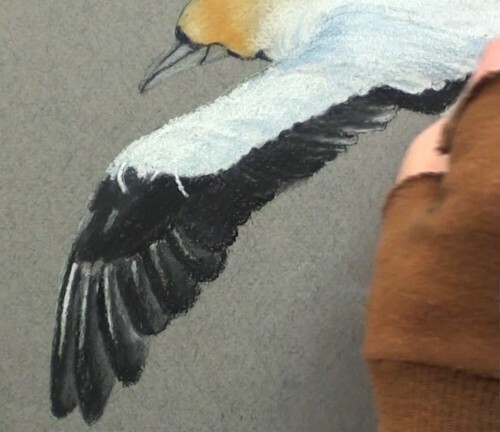 Begin with a Black pastel pencil and block in the tip of the wing. 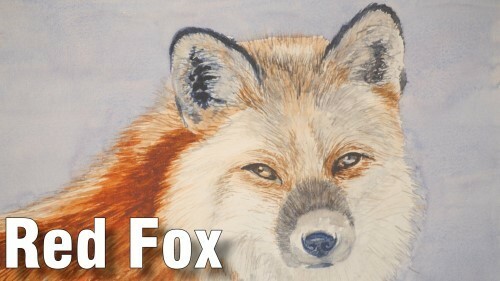 Start at the top of the painting and work downwards to keep smudging to the minimum. Fill in all the black feathers. Negative paint in the edges of the upper white feathers. 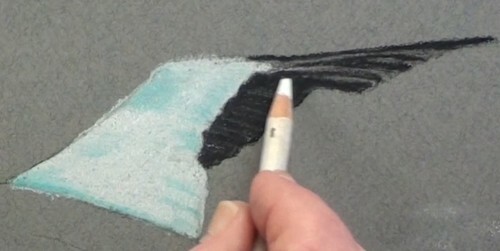 Use a small rubber shaper to smooth the pastel. Lightly smudge in the Gray between the primary feathers. 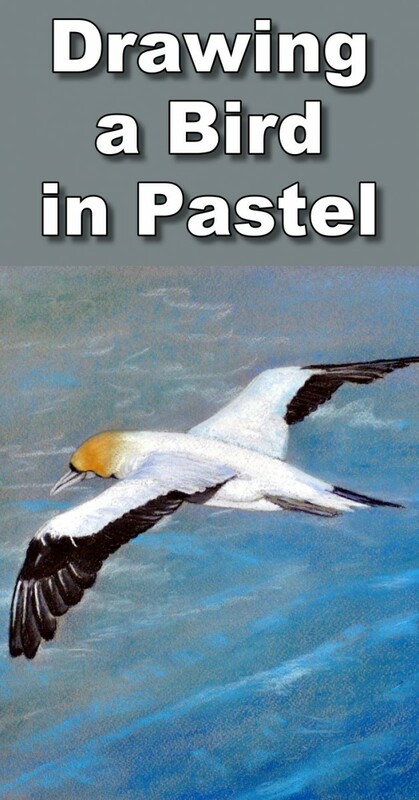 Now add some soft White to the wing and with a White pastel pencil smooth it out and half press it into the paper. 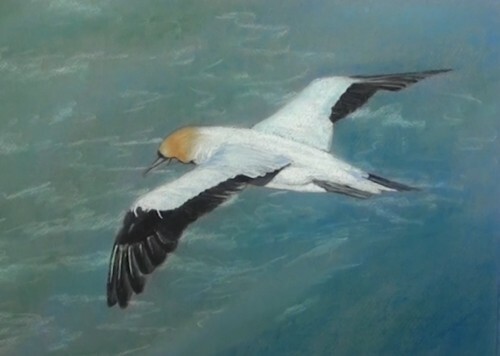 With a light blue pencil, very lightly apply the sky reflection on the feathers. Gently smooth it out with a rubber blender or similar. 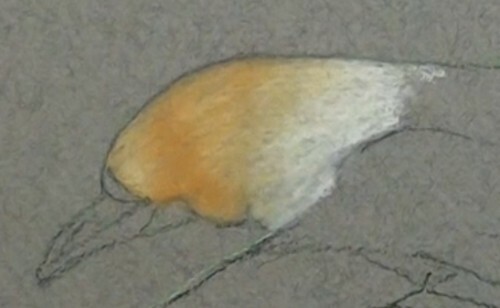 With a White pastel pencil, very lightly indicate some reflections on the black feathers. With a Yellow Ochre pencil start blocking in the head. Add a touch of Orange to the top. Add the rest with a White pencil and carefuly blend all smoothly together. Block the body in with Soft White pastel stick and smooth it out with the blender. Touch up the edges with the White pencil. With a Black pencil add the wing shadow. Paint the beak in with a light Gray and outline with Black. With Black and Gray fill in the tail feathers and the tucked in feet. With an Ultramarine pencil, lightly touch the sky reflections onto the body. Block in some Soft White on the wing. Add the black Alula. Smooth the White and add some sky reflections. With Black add the shadows of the secondary coverts and then add the lighter colour and blend. Now add the White stripes to the Primary Coverts. Add the dark shadows and add the lighter reflections to separate the feathers. Don't be too hasty here. Take your time. Continue doing the same to the other feathers. Complete one feather at a time so as not to get confused. 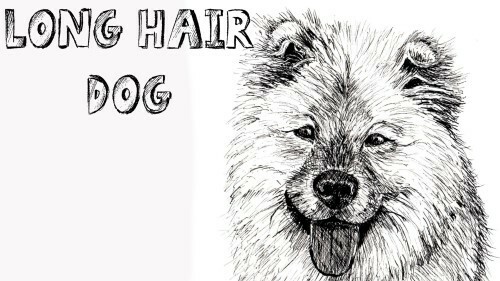 Blend with a stump and the White pencil. Once again, take your time with this wing as it is the nearest and largest section of the bird. With the side of an Ultramarine soft pastel stick start blocking in the background. You don't need to cover it in completely if using the Gray background. Over this block in a Blue Green colour and, with the finges, blend them together. Notice that some of the Gray is still shining through.With some Soft White begin to lightly stroke in some hints of the waves below the Gannet. Darken the lower right corner some more and gently blend. 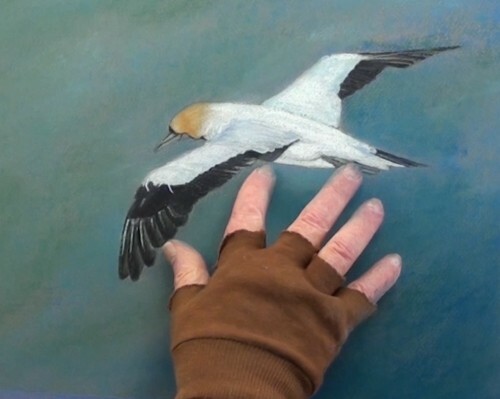 Be very careful when blending at the edges of the Gannet. Now, with the side of a White pencil softly stroke in some waves and the loose foam lines on the surface of the water. With a very soft touch of the finges gently blend the White. All these waves are to be slightly out of focus so as to emphasize the bird. Keep on adding and softening until you have sufficient movement on the water.